The beauty of the World's Healthiest Foods, and their associated health benefits, seems to be a reflection of the natural synergy of all of their components: the totality of what they provide. This is not to say the benefits of each of the isolated components are not important - they are. It just means we should not lose the forest for the trees, that is, in their natural state, in whole foods, these compounds work together synergistically. Current scientific research supports this concept. Health-promoting foods work better when consumed containing as much of their original complement of nutrients as possible. Studies exploring the relationship between diet and health consistently show health benefits from eating minimally processed whole foods; whereas, studies focusing solely on isolated compounds have yielded mixed results. So, while a food's individual components may be important, research continues to support that our bodies need more than isolated nutrients; for optimal health, we need the full complement of phytonutrients in whole foods. This complement of thousands of health-promoting compounds provides a synergy of health-protecting effects in our bodies and is likely to contain many yet-to-be discovered beneficial components that are also integral to the vibrant health offered from the World's Healthiest Foods. At Sycamore Spring Farm we value ancient wisdom and scientific research. We aim to keep producing simple, basic, traditional whole foods. 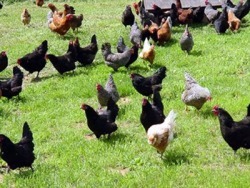 Our healthy, heritage flocks roam and forage through green pasture and woodland. Ample fresh air, sunshine, wing flapping, dust baths and all the things chickens love, reduces stress allowing them to mature naturally and be happy, healthy chickens. No residue from pesticides, drugs or other chemicals is possible since none are ever used. All this, coupled with exercise and insect variety in their diet, substantially increase excellent texture and savory flavor plus Omega-3 Fatty Acids and Vitamin A.